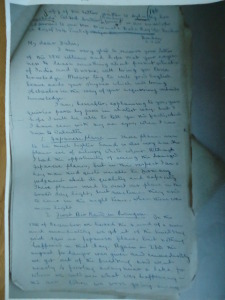 Below is a rare example of a letter written by an Indian survivor of the exodus out of Burma, following the Japanese invasion of 1941-42 (a photocopy of it came into my hands thanks to my wife, Deborah Baker, who found it in the Special Branch Police Archive, Police Museum, Kolkata). I have transcribed the letter exactly as it was written, keeping the original spellings etc. ; a few indecipherable words are indicated by a question mark. This letter, which was written in Bombay, on July 4, 1942, was intercepted by censors from the Special Branch and may never have reached the addressee. This copy was made for the Special Branch in Calcutta. The copyist’s note is at the top of the page (it’s quite possible that it was the copyist who was responsible for the peculiarities of the syntax, spelling etc.). If anybody who reads this should happen to know of the writer and his family I would be glad to hear from them. Copy of the letter written to Dulu by her Bardada (eldest brother) (Bombay) found in an envelope addressed to one Mrs Nirmala Bala Roy c/o A… [?] Ch. Roy of 348 Pratapaditya Rd. I am very glad to receive your letter of the 28th ultimo and hope that your eagerness to learn something about the recent situation of India and Burma will bring you true knowledge. Always try to write good English. Leave aside your shyness which will bring you debacles in the way of your acquiring outside knowledge. I am hereafter, explaining to you, your queries para by para in shortest way, but I hope I will be able to tell you the facts, which I have seen with my own eyes, when I come to Calcutta. Japanese plane – Their planes seem to be much lighter. Sound is also very low. The planes are of silvery white colour. Although I had the opportunity of seeing the damaged Japanese planes, but in this respect I am a layman and quite unable to form any judgement about its quality and capacity. Their planes used to visit our place in the broad day light, but sometimes they used to come in the night time, when there was moonlight. 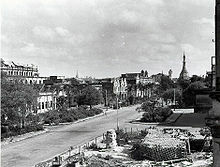 First Air Raid in Rangoon. in a car, we could see nearly 35 planes flying over our heads. Immediately we reached a certain place the bombing started. From the place where we were, we could see the smoke as well as we could hear the sound of bombs + Anti Aircraft guns. Over our heads we could see the fighting of the planes. We could see planes shot down by our British air pilots. Nearly after two hours of this happening, we went to our office but could not see anybody there. Being very much afraid when we were about to return home, I was very eager to see the place which was bombed. Not very far away from the Railway Station where we could not get the trains, we could see the heaps of dead bodies lying scattered here and there. Thirty buildings sustained damage very severely, but a few building were levelled to the earth. Fire started in the locality and the A.R.P. [i] volunteers were very busy removing the injured in the hospital or to the nearest shelter. Particularly one road where there were heavy casualties, was full of blood. 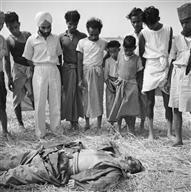 of the previous day.§ It so happened after a few days that there were air-raids six or eight times within 24 hours. Some nights we had to pass without sleeping and some days we had to pass without food. Nearly after a fortnight we were accustomed to bear all these difficulties. We were able to distinguish by sound the Japanese planes. In the month of February when it was quite impossible for us to stay there, we came to Mandalay, where also the place was first bombed on the 19th February. Expecting the grave situation, we determined to come to India by overland route and proceeded immediately. We had to cross many hills and mountain. First we hired a country boat in which we were for 16 days continuously. This journey we took [started in] a place named Monywa. After 16 days journey we reached Kalewa. From Kalewa we came to Kyigon by country boat. we had to pass couple of days without water … we have seen plenty of people in dying condition. From our company also we lost two. When we were above the hills, we were very eager to see the low land, as the continuous journey over the hills, which was most risky + made us more weaker. But through the grace of God, we could pass through the ordeal of journey + could reach Imphal and I could be my old self which I reached home. I think I have not been able to give you the vivid description of what happened but if I be able to see you, I will explain to you personally everything point by point.When you are so interested to knowall these things I will not keep you uninformed. Nothing more today. My love to you, Bulu, Ranu, Sisir + Gaetry and my respect to Babu and Ma. I am quite well, hoping you all to be the same. Your Boudi[ii] with all the children are quite alright. What a haunting letter – and photographs. I’m ashamed I know so little about this infamous period of history in this area of the world – do you have any books you would recommend to start to build my knowledge? (fiction or non-fiction is fine). 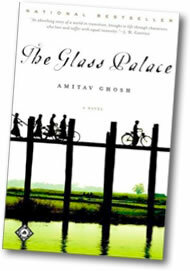 You could try my book, The Glass Palace.